"An easy, different way to grill fish fillets and make people think you slaved all day." Spread a thin layer of sesame oil and chili sauce onto one side of each fish fillet. At one end, place some of the leek and a couple of mushrooms. Roll towards the other end. Wrap each roll with a slice of bacon, and secure with two toothpicks. Delicious! Substituted enokie mushrooms for white button mushrooms and served w/grilled vegetables. Yummy dish. Instead of doing individual stuffed pieces we made one big roll and then grilled it and sliced it. This was much faster. 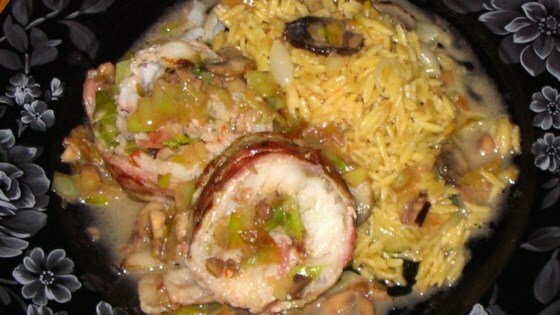 I made this a while ago but as I did not have any leek or mushroom, I only made the cod wrapped in bacon. Still taste good to me! :) Thanks for sharing this simple recipe.